I got lucky a several weeks ago when I was out bargain hunting and found the last Kre-O Transformers Battle Changer set. Box. Base price was $5.99 at Marshall's, for a $0.08 Price per Piece. Parts. There's a nice selection here. Only a handful of singular parts, most have at least two of each. As usual the Kreon bits are in the upper left corner. The Double Bar Plate (open ends) is still really interesting as are the 1x1Round w/Bar. Lots of Plates, Modified Plates, Slopes, Ball Joints, and other pieces. Build. I went old school this time and built something close to one of my Crab Mecha, and a little micro scanner unit. Stats: 2Ra+d8 (long guns) 1G (extra legs) 1Y (bot) 2W. I found this in a small seasonal game/toy/puzzle store in a local mall. Box. MSRP was $6.99 for a $0.16 Price per Piece. Parts 1. That motion "block"
Parts 2. The 1x2 Double Axles are intriguing. Everything else is pretty standard. Build. A small IO Frigate. Score: -5 (B-). If you can find this at a decent price it might be worth your time. So I saw these at my local Walgreens the other day and thinking they were backstock I decided to grab a few on a whim. It turns out they have made some changes and these are new releases. Since the normal review system didn't work too well for these the last time around I'm going to try my non-Building Block review system on these. Bag 1. I paid $2.99 for this at Walgreens. Parts 1. Something you can't see in this picture is that the posts on the torso and waist are now hollow and there is a bar inside the torso that slots into the hollow waist post. Parts 2. Something you can see is the new base for the Kreons to stand on instead of the old 2x4 Brick. Assembled 1. I'd say 2Rh+d8 (chainsaws) 2Rd (chest gun) 1B (helmet) 2W. Assembled 2. Let's call this one 2Rd (gun) 1B (helmet) 2G (backpack & wheels) 2W. Score: +20 (A+). A better score than if it had been reviewed as a set. Score: +20 (A+). Again, the max score. A quick review for the middle of the week. Parts 1. The printed 1x1 Round Tiles in the middle left of the picture are interesting. As are the 1L Pin Connectors in the lower middle. Parts 2. Nothing too exciting here. Lots of Plates, Slopes, Rims, and Tires. The Offset 1x4 Modified Plate is always fun. Build. A simple IO Frigate. Score: +15 (A). A decent score but it doesn't really have the right kinds of useful parts for MFZ. Since we are heading into the "Back to School season" BJ's has a few Lego sets in stock again. They have three sets at $16.99, 60115 4x4 Off Roader, 60116 Ambulance Plane, and 60118 Garbage Truck. That's a Price per Piece of $0.10, $0.09, and $0.07 respectively. They also have 76047 Black Panther Pursuit, and 76034 Batboat Harbor Pursuit for $25.99. That's a $0.09 Price per Piece and a $0.10 Price per Piece respectively. As always, YMMV and Good Hunting! It was a busy weekend for me, so here's some nice pictures. some really neat techniques in this build. design. I just wish he had a better picture of it. Jiangshi Qx-9 Yaoguai by .Tromas. Wow. Just, wow. No downloading though. sure how it would stand up to game use though. might be a little large, but I like the alien look of this. 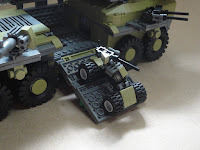 Since I have some older reviews of non-building block kits that were done before I came up with a system to rate them I'm taking a moment to go back and "re-review" them. Score: 0 (B). A few removable pieces to represent White dice damage and this would have been a really good set. Score: +20 (A+). A Gundam Converge set finally scores the max! Score: +20 (A+). Another max score! I think this is my favorite Gundam Converge set so far. Score: +20 (A+). Another max score! Score: -5 (B-). The lowest score of the new system so far. I've seen an increasing number of sets from this company in third wave retail stores. I figured I'd do a review of a small one and see how they are. Box. I paid $3.99 for this at a local game, toy, and puzzle store. Which is a $0.07 Price per Piece. Instructions. Which has a different set number than the box. Parts. So the Plates in this set are roughly 1mm thicker than normal Lego Plates. Other than that we have a decent selection. Those White round pieces in the lower right are Rims for the tires. There's also an extra base for the Antenna piece. A couple of Clip Tiles, Grille Tiles, and a 2x2 Studless Slope round out my favorite pieces from this set. the new normal with vehicular sets. Score: +20 (A+). Top score right out of the gate. Target is running a 40% off on Dimensions, and 20% off on Nexo Knights sale this week. Toys'R'Us is running a 20% off Jurassic World, Scooby Doo, and Angry Birds sets this week. There used to be an old Collectible Action Figure/Card Game called Z-G designed by Mark Rein-Hagen. This is what the action figures looked like. Now, I hadn't thought about it until the other day -- because someone brought it up on a forum I frequent -- but these figures might work for a larger scale game of MFZ. I actually own one each of the Green one and the Blue one and I'm kinda intrigued by the thought of using them at some point. Noble Knight still has the Green one in stock, and I've heard of other sources for the figures. Let's finish up the "Creatures of..." sets from the current Bionicle line. Parts 1. There's a new piece in this set, a Black Technic Pin w/Friction Ridges Lengthwise & Pin Hole. Along with a ton of useful parts. Parts 2. I like the Orange flame pieces, and those Blue Exo-Force Arms are going to be useful. Build. Not that great, but I was in a hurry. Score: +20 (A+). A good way to finish out the line. Let's continue looking at the "Creatures of..." sets from the current Bionicle line. Parts 1. It's interesting to see the Axle & Pin Connector in Bright Green. The Bionicle Chain Links are interesting too, as are the Pin 3L w/Friction Ridges Lengthwise & Center Pin Hole (middle left). Parts 2. The hinged jaw pieces are still interesting as are the Wide Curved Blade Hero Factory Weapons in the lower left. Parts 3. These were loose in the box. Build. I managed two out of this set. Score: +5 (B+). Another decent score for this line of sets. 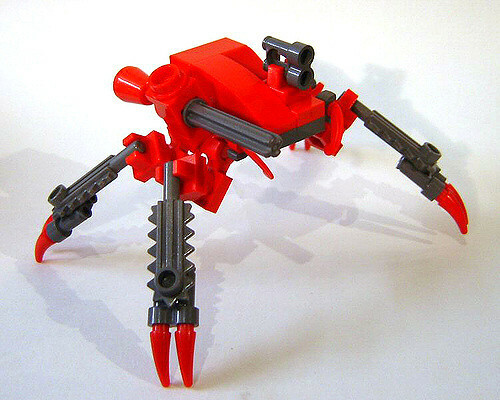 Let's take a look at some of the "Creatures of..." sets from the current Bionicle line. Box. MSRP is $9.99 for a $0.14 Price per Piece. Parts 1. Here we have the majority of the small parts. The Unicorn Horns are pretty interesting and should make for excellent greebles. Parts 2. These are the larger pieces. Those hinged jaw pieces in the upper left look interesting as are the Trans-Purple Clip Claws. Build. I managed to pull three out of this set. The two on the outside are 2Rh/1B/1G/1Y/2W. The one in the middle doesn't have any stats yet. Score: +5 (B+). A decent start for this line of sets.